As soon as I decided to move to Mexico, I started packing for my trip. Of course, I didn’t want to be without a car in Mexico and didn’t really want to limit myself to only bringing things in a suitcase on a plane or try to orchestrate a huge international move. My dear friend, Tina, kindly agreed to accompany me on the multi-day trip. It was such an adventure! The trunk and backseat of my little black Jetta were packed to the gills. I had books, music, a television, sporting equipment, a computer, and more. You could say that I had everything except the kitchen sink. We pretty much breezed through the south, except for one incident from a friendly police officer in southern Virginia. (I told him that I was driving “efficiently,” that I was not “speeding.”) Everyone had suggested that Laredo, Texas was the best place to enter Mexico. McAllen, Texas would have been closer, but the drive in Mexico would have been more difficult and less direct. And I didn't want a difficult drive. I crossed the International Bridge in Laredo and got to the Mexican border. Crossing the border at this point was a breeze. 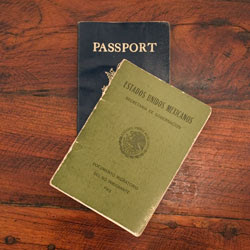 The officials just looked at our passports. It was almost too easy. Our next adventure was to find the tourism office located in some obscure part of Nuevo Laredo to obtain a permit for my car. That was NOT such a breeze. We carefully navigated very sketchy parts of town and finally got to the tourism office where I had to get “the paperwork” for my car to stay in Mexico for 6 months. After 2 hours, at least 5 immigrations officers, 20 official stamps on various papers, and about $20, we were good to go. WHEW. Bureaucracy at it's best. . .or worst. We started on our way to Monterrey and Saltillo, where we spent the night. As a side note, it's a good idea to drive during the daylight hours in Mexico. Even though the toll roads are safe, they are not always well lit and animals or slow moving vehicles are a danger. My friend Cecilia's mother, who was very proper about things, also told me that "ladies simply do not drive at night in Mexico." I took her advice for this trip. 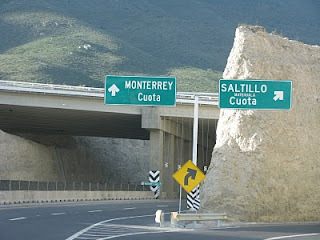 In Mexico, there are not a lot of choices in roads between cities. You basically have two choices, the libre or the cuota. The cuota roads are toll roads that are well worth the often expensive cost. Many libre roads are very old and are in disrepair and it takes much longer to get to your destination por la libre. As an example, you can get from Mexico City to Acapulco in about 3 hours on the toll road, but the libre takes about 6 or 7! I spent about $250 in tolls from Laredo to Mexico City. The free roads will take you through picturesque villages, but these villages are full of mega large sometimes unmarked speed bumps called topes. 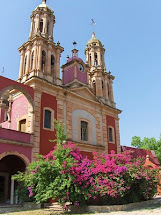 After spending the night in Saltillo, we finished our journey on the second day going through Matehuala, San Luis Potosi, Queretaro, and finally Mexico City. The toll road from Saltillo to Matehuala was full of curves in the mountains and we encountered lots of slow moving trucks, many without taillights, but the drive was a good one. From San Luis Potosi to Mexico City, it was smooth sailing. The highway signs are very easy to follow by looking at the name of the next major city along the way. There is little variation away from major cities in the highway system. This sign means toll road ahead. 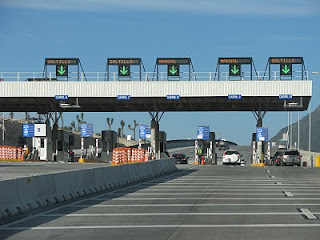 Another advantage of travelling on the toll roads are the Angeles Verdes, the green angels. This is kind of like a government sponsored AAA club. 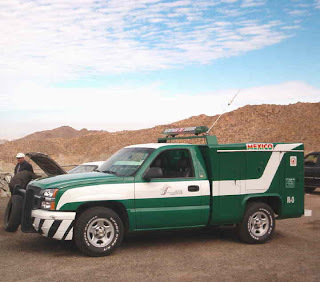 The green angels patrol the highways and help drivers who have car trouble, flat tires, or other needs. 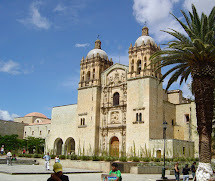 Once, I had a flat tire travelling from Oaxaca to Puebla and was alone in the car. I’m ashamed to say that to this day I’d be hard pressed to change a tire. The green angels came to my rescue and put on the spare at no charge. Although I had spent a significant amount of time in Mexico City, my navigational skills were not the best and this is all in the pre-GPS era. 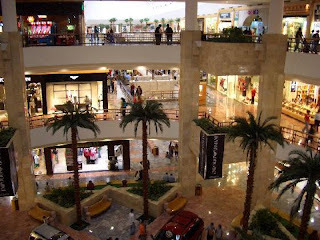 I knew how to get to my friend’s house and how to get to the best mall called Santa Fe! Leave it to me to remember how to get to the mall. It was a great feeling to arrive in Mexico City. I left my car in the garage for the night and the next day I went to see my apartment! 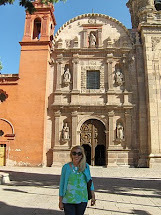 Keep reading as I unveil the many chapters of my Mexican adventures. So exciting...I can't wait to read more. My dad lives in Monterrey! He was transferred down there from Chicago and he's been there for about 6 years. 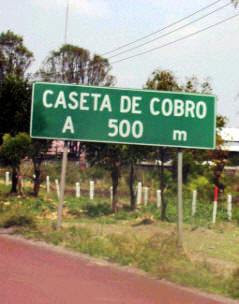 I have been to Mexico but never to that area. He is retiring next year and will be leaving Mexico so I better get down there. Love hearing all about Mexico! It sounds like such an adventure and its so neat to see the pictures from your road trip! Great story... keep the chapters coming!